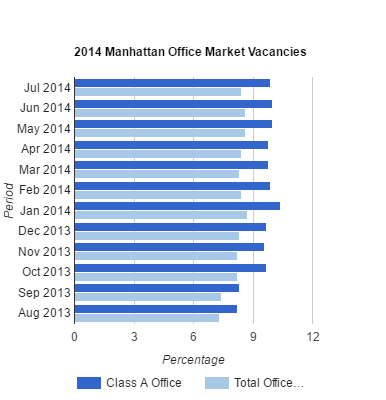 The Manhattan office and Manhattan retail markets are as hot as the temperature outside. There were declines in the amount of both office and retail spaces in all markets except for Midtown South. In Midtown South, a number of buildings previously off the market were added back to the available inventory of office space. New York is in desperate need of new office buildings. Buildings are planned and under construction but delivery dates are in the distant future. As a result office rents are rising! Manhattan will see new office construction of 9 million square feet between 2013 and 2015 which would be the fastest pace of development since 1990. Commercial property in New York City is overpriced compared to its counterparts elsewhere in the country This was the result of a poll which surveyed New York City’s top commercial real estate professionals. An array of Midtown’s large office buildings are working to backfill mega-blocks of space slated to be left vacant when tenants with hundreds of thousands of square feet move out. And they’re doing so on the precipice of a supply boom the Manhattan market has not seen in a quarter of a century. The Manhattan office market rebounded in May following an April slowdown, as the media migration Downtown continued and activity in Midtown South held steady with a number of modestly-sized leasing deals.